The narratives associated with this page are the opinions of the webpage author and should be accepted as such by anyone reading this page. 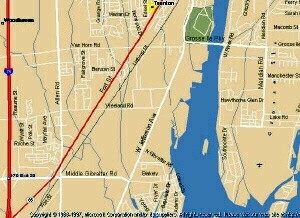 Many of the images such as maps and so forth can be copied to your machine and then expanded to allow a more detailed look at its features. Some of the images have good detailed data such as water depth, camping areas and boat ramps that will be available when the image is enlarged. URLs for webpages have been added where possible, so just click on them and go right to the source for hard data. I don't believe it is necessary nor desirable to show the exact location of everyone's fishn' holes as it probably would be counter productive and may not at all increase the catch of a fisherman. Some fishermen are rigged for certain type fish and may not do well in someone else's fishing hole and so forth. Now here's a nice little lake right close to home, about 5-6 miles from Centerville. Its about 18,000 acres averaging generally 15-20 feet deep depending upon the part of the year you measure it. Its part of a Corps of Engineers flood control project on the Chariton River so the depth kind of fluctuates but they do try to maintain a steady level when the fish are spawning to ensure maximum hatch. Another thing about the lake is that its part of a water supply project, supplying fresh water to farms and communities for miles around. Because it is used to supply water, the lake bottom was cleared of all trees and brush before it was allowed to fill with water. As a consequence of the clearing, the lake has no good cover for fish but they seem to do OK. The largest and most modern fish hatchery in Iowa is located just below the dam of this lake and these folks make sure the lake, one way or another, gets its fingerlings. This facility can be toured at times, I'm pretty sure. Just look up the Iowa Conservation Commission or just drive down to it right below the dam. 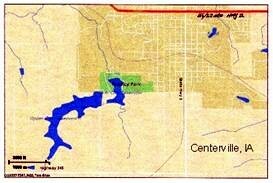 The lake has parks, etc and is used for recreation as well as fishing and folks do a lot of water skiing and whatnot. This in hot weather generally, when the fish are not quite as good as earlier in the year when its cooler. There are park areas and boat ramps surrounding the lake and it has 2 or 3 marinas. The image to the left can be copied and expanded should need arise. The lake has been stocked with largemouth bass, crappie, walleye, muskie, tiger-muskie, channel catfish. I have also caught at times carp, white bass, bluegill and the normal rough fish that populated the river before it was dammed. I guess you could say this is the sister lake of Rathbun. It was built soon after Rathbun but farther south on the same river system but in Missouri. 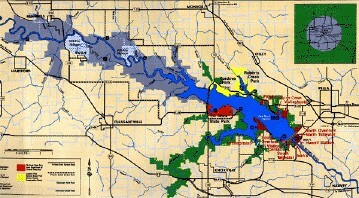 The lake is actually on the East Fork of the Chariton and not the regular river. As you can see by the map, it is just 2-3 miles west of Macon, Mo. This lake was stocked with more or less the same fish as Rathbun. The two lakes are very similar excepting Longbranch is smaller. 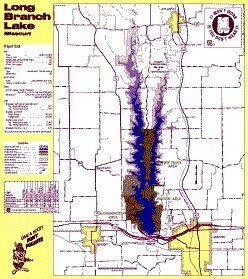 The lake is not as far along in development as Rathbun regarding parks and other facilities which attract large crowds. The lake has only one Marina, etc but rest room facilities and some parking for camping is available. I'm not an authority on Longbranch but it seems to me that the lesser degree of development for recreational facilities, water skiing and such, could mean better fishing. Now, both of Gene's fish'n brothers worked and lived around the Macon- Bevier area and have done a lot of fishing there. This is the lake where brother John caught the large blue catfish. The lake has easy access, good water and fish and that's what counts! 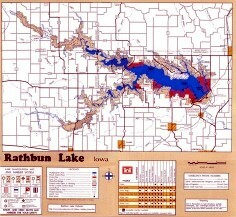 This lake is very similar to the Rathbun lake. Similar in size, type, fish, etc. It is formed from the damming of the Des Moines river near Knoxville, Iowa. It is larger during high water periods but designed pool levels and sizes are much the same as Rathbun. This lake, I do not believe, has had the experience of having Congers fishing it. We have discussed this over-sight, just this last winter as a matter of fact, and my guess is this lake will soon feel the subtle hand of a so-so Conger fisherman in its waters. Let's hope this lake is as productive as most of the others in the area. We plan to establish this lake's willingness to yield up its fishes this year. I believe this lake was stocked with northern pike instead of the muskie but the other fishes should be about the same so we will not have to make any major adjustments. I, personally, have never fished this Kirkesville, MO lake but I understand that it is a nice lake and that there is bass there and probably some of the different panfishs and the ever present catfish. When I was in the Quad-City area several years ago, I worked a couple of times with this carpenter, who I had fairly high regard for, who did a lot of fishing and I mean, a LOT! This fellow fished every weekend for nothing but bass and was using "bass" boats before anyone even knew what they were, he probably helped invent them. Anyway, I asked him one time where he did most of his fishing and he named off several spots and and would you believe Thousand Hills was right at the top of the list. I knew where Kirksville was but had never been to the park. I also asked him what he fished for and I remember he said, "Bass, nuth'n but Bass." I ask when he fished and he said, "Every weekend - EVERY weekend, I don't drink beer, so I fish!" So, I said well, what time of the year, the summer? And he said, "From the time the ice goes off until it goes back on." So, there must be something in that lake to attract a fisherman of that calibre! 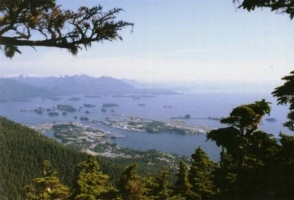 Now, I've never been to Sitka but I have fished similar water at "Port" Seward, Alaska and if Sitka is anywhere near what Seward was, its wonderful. From photos I've seen, they're probably about the same. I can guarantee that you will find no more scenic fishing in the world than you will in our very own Alaska and Sitka is in the forefront of this fisn action. For more details about the area ... click here. There are lots of hills, some mountains with glaciers and plenty of snow melt. This is, indeed, one of the best fishn holes around. So, be sure and check the Gene's Fishn Stories page for some tales of this fishn. Art Sehnke tells us that he and his buddy Ron caught their nice catch of walleyes in the "Trenton Channel" on the lower Detroit River where it enters into Lake Erie. He says there was about 8 ft of water at the spot where they took the fish. He says folks can launch their boats at Elizabeth Park just off King Road. You can see their fish on the "Stories" Page. He tells us it was April when they were jigging with chartreuse jigs and got the fish. The area has been added to the Professional Walleye Anglers Association listings and Art is wondering if that's such a good idea because the waters there are getting a lot of fishing pressure as it is. My grandsons, Troy Cassady and Ethan Hawk have been going over to the Centerville, IA reservoir and doing some fishing this summer. They have done pretty well as two youngsters who go fishing by themselves. They have caught 3 or 4 messes of fish already and have caught some that were respectable size for rod/reel fishing. I knew that many people fish there but I just never got serious about the place – maybe I missed something? You can see the fish in the Fishn Stories section under Hawks’ Fishs.